Once I decided to learn a speedsolving method, I’ve practiced pretty regularly ever since. Generally I feel I’ve progressed much more slowly than most people. It took me just short of 5 years to get my first ever sub-20 average of 10 solves. I then took about a year per second faster after that. I was at 15 second averages from 2004 to 2008 and only in the last 6 months have I finally dropped my averages to fairly consistet sub-15 seconds. So it took me about 11 years to get sub-15 on a somewhat consistent basis. I use the Fridrich method, but I am very free form during the F2L. I often build an extended cross or 2x2x2 instead of the cross. I also often use partial cross, where I begin solving my F2L before I have finished the cross, and I finish the remaining cross pieces whenever it is convenient to do so during the F2L. For the last layer I use the regular OLL/PLL with the addition of COLL, some ZBLL, and I also use a bit of partial edge control by using the faster ZBF2L cases I remember from when I used to study the method. I am currently a teaching assistant at Full Sail University in Florida teaching mathematics. I love math, and have been either tutoring or teaching it since 2005. I mostly just practice blindfold events. My favorite event is 4x4x4 blindfolded, followed closely by 5x5x5 blindfolded. I also enjoy 3x3x3 blindfolded and 3x3x3 speedsolving. I don’t practice much else outside of those events, other than 3x3x3 fewest moves. My favorite event is definitely 4x4x4 blindfolded. I’ve been fascinated with the 4x4x4 cube ever since I started solving the 4x4x4 supercube for the first time. I also love the pace of solving 4x4x4 blindfolded, and I compare it to middle distance running. It’s not so fast paced that you must have a God given talent for memorizing, and practicing memory techniques can make the process very fast. It’s also not so long that it becomes an endurance BLD event and you have to work on how long you can maintain your focus without forgetting things. This is definitely my favorite event. I have seen the HUGE growth in the Indonesian speedcubing community, and it is very exciting! I met some Indonesian cubers at Worlds 2009. I personally spoke with Maria Oey and she introduced me briefly to Arnold Soeparjanto as well. 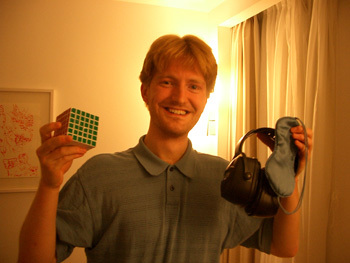 I have talked with Chuck online as well about blindfold cubing, and he is also a very nice guy! I have also talked with some Indonesian cubers on facebook, and have enjoyed meeting so many people from the Indonesian speedcubing community! I mostly use the Cube4You DIY cubes. I do have a 4x4x4 mini-Diansheng and V-cube 5x5x5 for my blindfold solving as well. As far as my competition achievements I am most proud of my former 4x4x4 blindfolded world record. I was very happy to be the first person to break the 5 minute barrier, even though the record has since been beaten. I also feel that I have made some contributions to the speedcubing community through theory. I am most proud of inventing the extended cross solving approach (Xcross) for the Fridrich solving and having it catch on so well, and for the BH blindfolded solving method that Daniel Beyer and I both co-invented. 10. You are very good at BLD, what do you think about BLD in the world now? And in Indonesia? I think the times for blindfold solving are getting extremely competitive. I like to think that I can still put up some respectable times, but I feel that many people are faster than the level I am at now. I, of course, still love BLD and will continue to practice and try to improve my times to the best of my ability. I have seen a graphic showing the proportion of Indonesian BLD cubers compared to blindfolded cubers from other countries, and if I remember correctly Indonesia was one of, if not the, largest group! There are so many amazingly dedicated/fast/accurate Indonesia BLD cubers today. It is very exciting to watch, and I look forward to seeing more of the amazing blindfolded feats to come from this community! 11. Would you come to Indonesia to play with us? I would love to! I have discovered from going to World Competitions that I very much love visiting other countries and other cultures, and I would absolutely love an opportunity to come to Indonesia! I sincerely hope that Worlds 2011 will be somewhere in Asia, since there has not been a world competition here yet, and if so I would quite probably extend my trip to at least make a visit to Indonesia! 12. What you hope for Indonesian cuber? I hope that the amazing community that has come about there will continue to thrive and produce great cubers, as it already has! Again, Indonesia is a very exciting cubing community to watch, and I really look forward to all the amazing accomplishments we will continue to see from them! Former World Record 4×4 Blindfolded, Chris Hardwick. gila… cuman mr hardwick yang pake… STACKMAT TIMER!!!!! enak juga diliat stopping timernya.